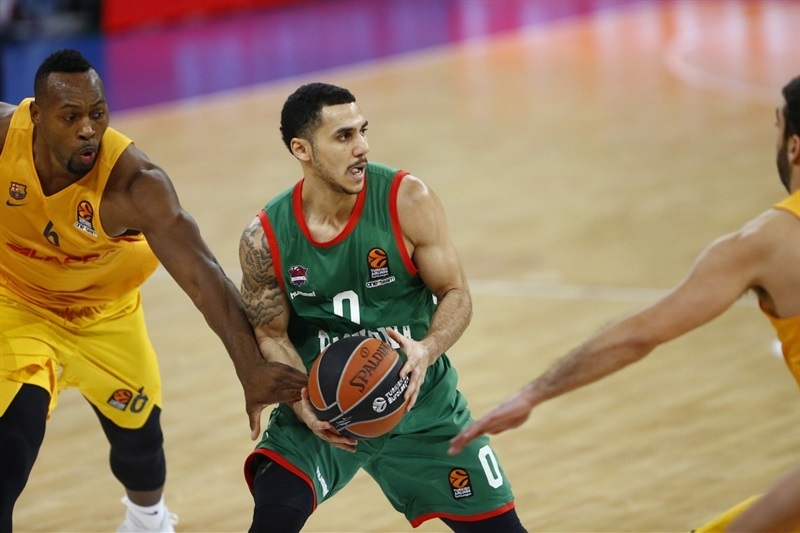 In an intense battle that literally came down to the final shot, Baskonia Vitoria Gasteiz rallied from a double-digit deficit to edge FC Barcelona Lassa 65-62 in front of over 14,200 fans at Fernando Buesa Arena on Wednesday. 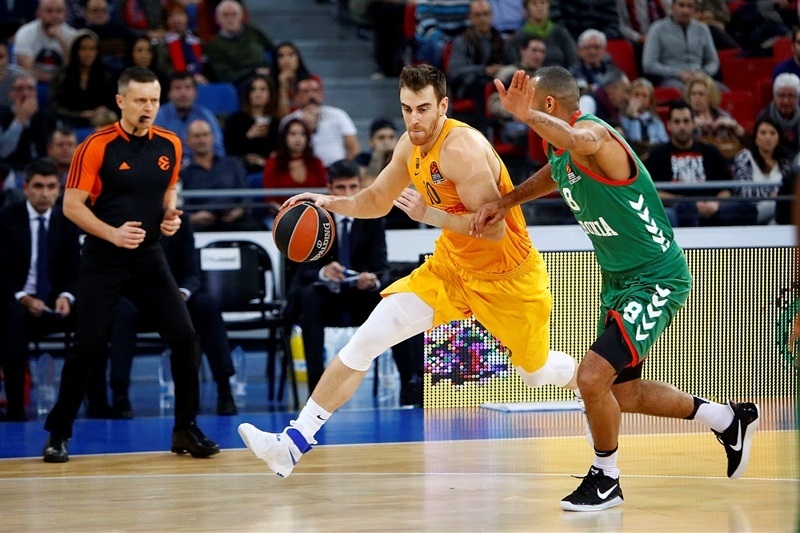 Baskonia improved to 9-4 and a share of second-place in the Turkish Airlines Euroleague Regular Season standings, while Barcelona dropped to 5-8 and ninth place. 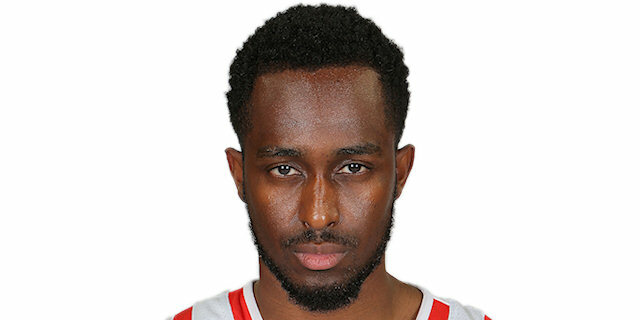 Rodrigue Beaubois led the winners with 19 points, Shane Larkin added 14, including back-to-back three-pointers in crunch time to put Baskonia ahead for good. 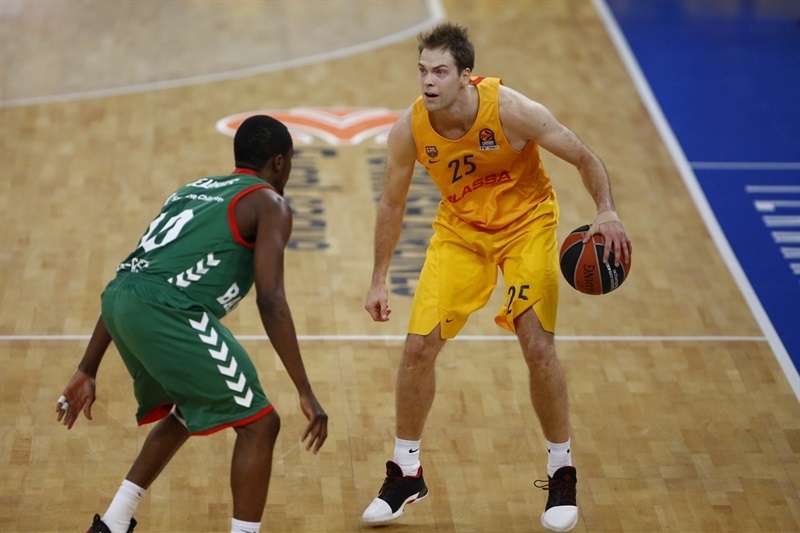 Ante Tomic paced Barcelona with 18 points, Tyrese Rice added 15 and 8 assists while Petteri Koponen had 13 points for the visitors. Barcelona excelled on defense in the first half, forcing Baskonia to miss all of its 10 three-point shots and make 9 turnovers. In fact, Barcelona limited Baskonia to just 24 points, tying for the lowest mark for Baskonia in a first half at home - Unicaja managed to do the same in a Top 16 game in the 2013-14 season. 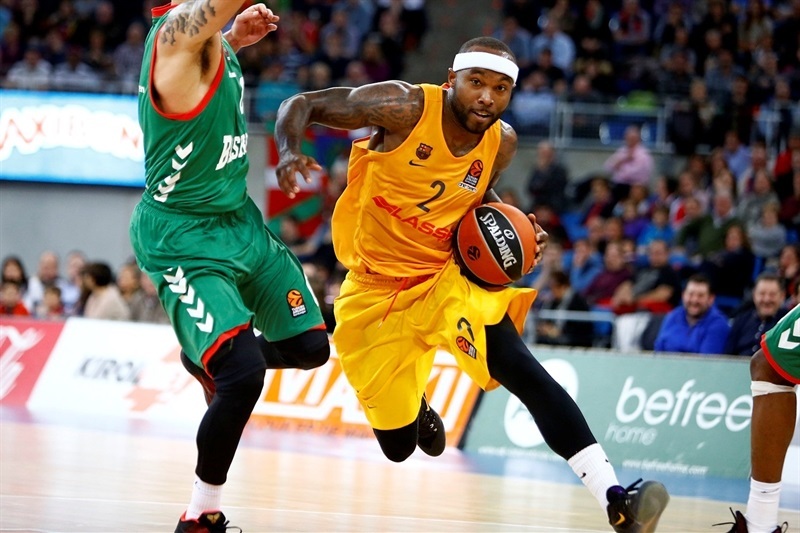 Baskonia bounced back in the second half and ended up outrebounding Barcelona 39-31. The hosts also collected 12 steals and drew 22 fouls, hitting 82.3% of their free throw attempts. A jumper by Koponen ignited a 0-9 opening run in which Justin Doellman had 5 points, including a triple that prompted a Baskonia timeout. 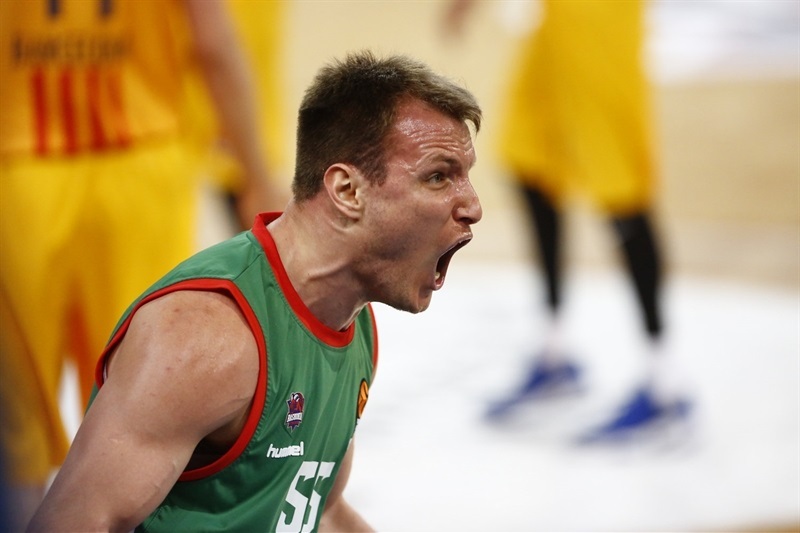 Toko Shengelia and Johannes Voigtmann stepped up with consecutive baskets, but a three-pointer by Koponen and an alley-oop slam by Tomic made it a double-digit game, 4-14. 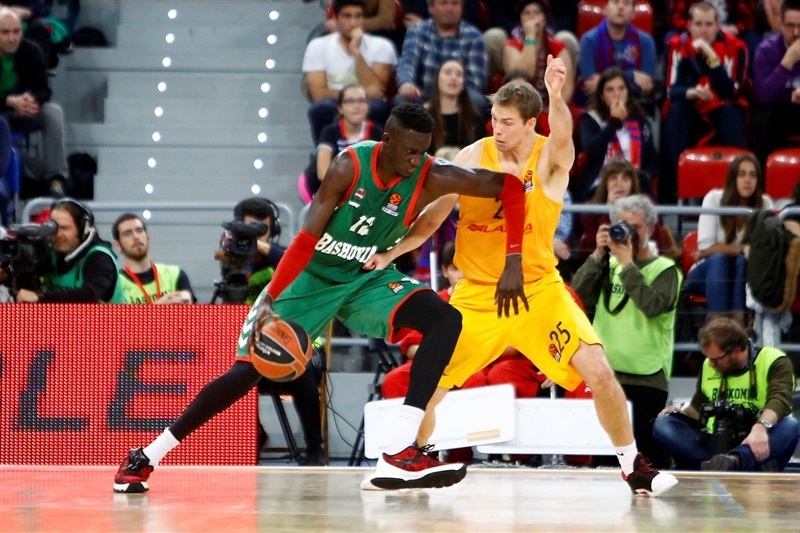 Shengelia and Adam Hanga brought Baskonia a bit closer, 9-16, after 10 minutes. 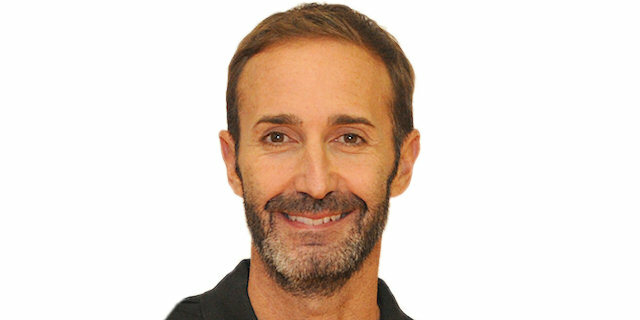 A driving basket by Juan Carlos Navarro and a three-pointer by Sasha Vezenkov restored an 11-21 Barcelona lead early in the second quarter. Kim Tillie and Larkin tried to change things for Baskonia and back-to-back baskets by Beaubois brought the hosts as close as 21-23. Koponen struck again from downtown, Tomic added a jump hook and a jumper by Doellman fixed the halftime score at 24-30. Koponen kept pacing Barcelona after the break and got plenty of help from an unstoppable Tomic to establish a 29-39 lead. Hanga stepped up with a triple and a layup-plus-foul, which Beaubois followed with a jumper for a 38-42 Baskonia deficit. A dunk by Ilimane Diop soon gave the hosts their first lead, 43-42. 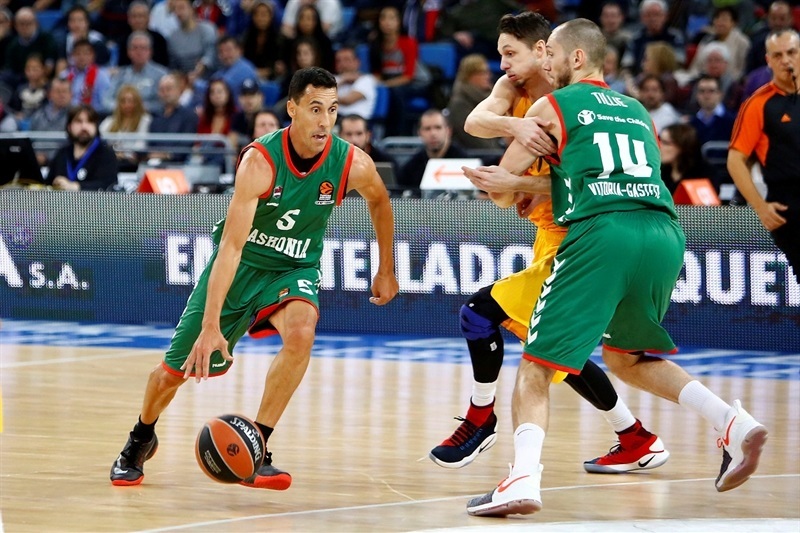 A buzzer-beating layup by Rafa Luz kept Baskonia ahead, 47-45, after 30 minutes. 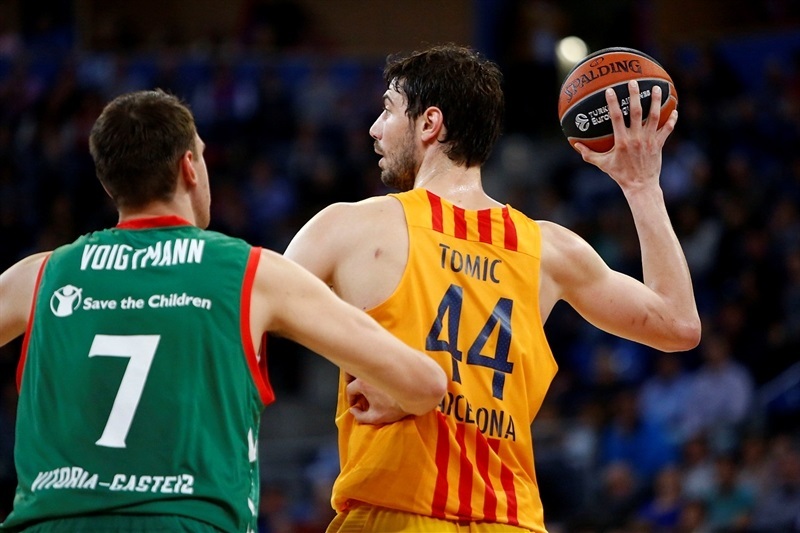 A dunk-and-foul by Tomic and a layup by Rice put Barcelona back in charge at 51-52 with six minutes left. A 6-1 run that Beaubois capped with a three-point play gave Baskonia a 57-53 lead, but Rice and Tomic helped the guests tie the game, 57-57, with 2:32 to go. Rice struck from downtown, but Larkin hit back-to-back three-pointers for a 63-60 lead with 1:09 left. Rice and Beaubois traded free throws before Barcelona called timeout with 13 seconds left. 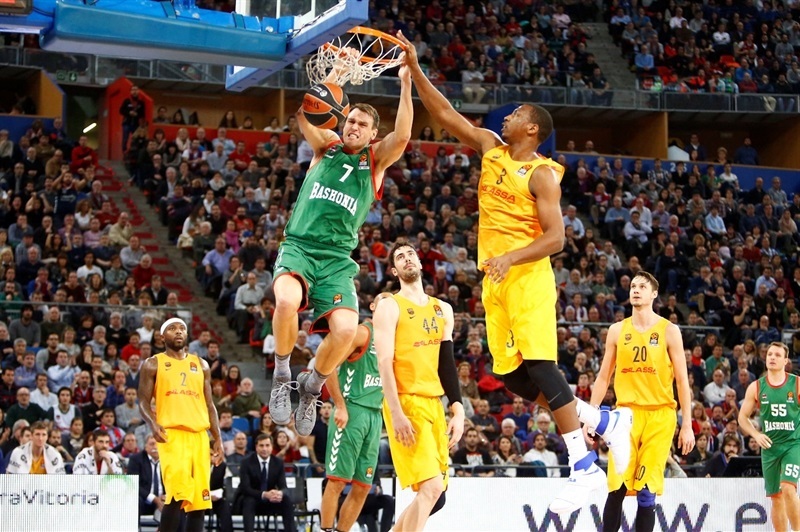 The visitors found Victor Claver for a shot, but he missed from downtown seconds before the final buzzer. "I am especially happy today because sometimes you are able to get a win playing better or speaking good things about our philosophy - running, scoring a lot. When things are going bad and we are not scoring or finding our mobility, when we are not comfortable, we have to defend and believe, play thinking about the victory without thinking about the things we usually do good. It is very important for us to learn this tonight. I am very happy; congratulations to my players and to our fans for showing a good lesson to everyone: when things are going bad, they supported us in a very good way. This victory is for them and for the players. When you analyze each player's performance or the team in general, nobody felt comfortable in the beginning of the game. It is true that they prefer to slow down the pace to prevent us from scoring as much as we usually do. In the beginning, we tried to run and found good shots, but missing them made us feel anxious throughout the game. We looked like we wanted to win the game on offense without playing good defense, and they kept finding easy shots. Everything changed after that because we believed in getting as close as possible to try to win in the end no matter what. Rafa Luz played a critical role with his defensive intensity and making people believe we could win. Larkin proved that, even not playing at the level he is used to, he can make two good decisions and show his leadership with two critical three-point shots." "First of all, congratulations to Baskonia for the win. It was, as everybody saw, a tight game. I think we controlled the game well because our basic goal was to avoid their transition options. They execute excellent on the open court and we wanted to stop this. I think we did it; we controlled the pace and the rhythm of the game. When we had the desire to pass the ball, we could have easy options with open three-pointers through our execution. 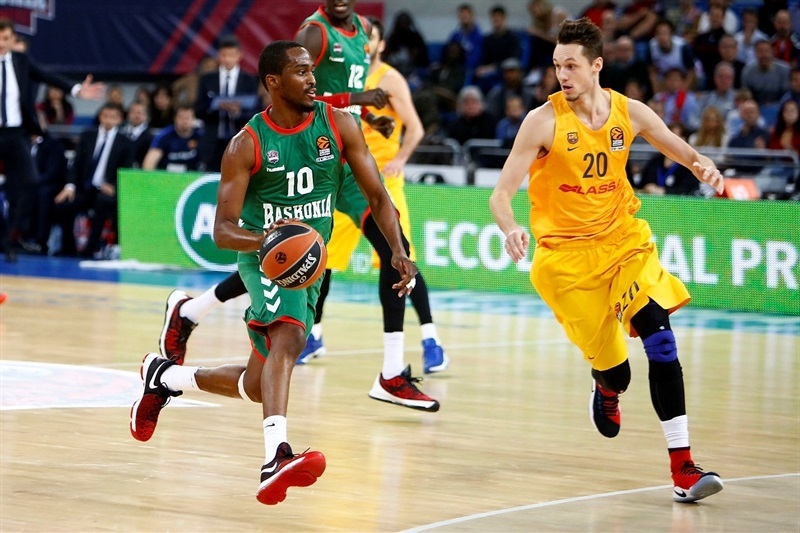 Whenever we rushed, we gave Baskonia the opportunity to get into the game. 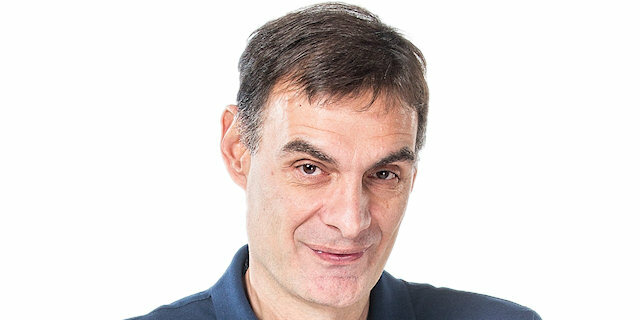 Finally, some bad decisions we made in the end went to Baskonia's side. We lost the game. 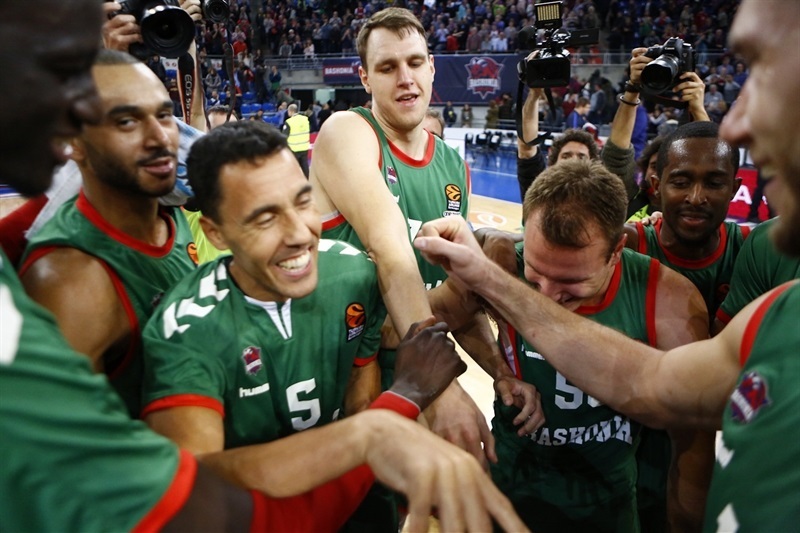 Congratulations to Baskonia. Every loss is painful. Every time you lose a game, it is the same procedure. I think we executed our plan very well for 25-to-28 minutes. 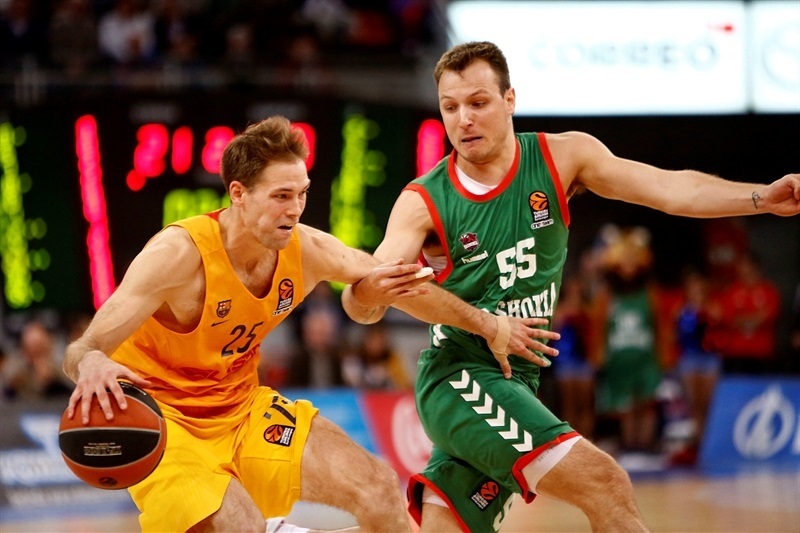 After Baskonia's comeback, we had a chance again to get into the game. We had patience and had good opportunities. As I said, one good or bad decisions decided the game in the end. I can say I am sad; I am always sad when we lose games. We had two more players out, Brad Oleson and Stratos Perperoglou, but we fought during the game and had a chance to win." "This victory means a lot to us. It was a big game against a very good team, but we fought together. We were all together and even when Barcelona played well, we never gave up. We kept playing and are very happy about this win. Coach told us not to worry about our first half and keep shooting because we couldn't do worse. That's what we did and finally shots went in."